Estrogen-receptor (ER)-positive breast cancer is the most common class of breast cancer, affecting nearly 70 percent of patients. By participating in an estradiol challenge, physicians can determine the likelihood of potential benefit of hormonal therapies targeting ER for individual patients. Many hormone therapies interfere with the ability of estrogen to regulate the expression of PR protein, which is more pronounced in the presence of estrogen. 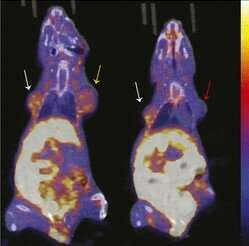 As such, several PET tracers have been developed to monitor and analyze changes in the PR level during therapy. "Typically, anatomic size and proliferation biomarkers are analyzed to determine endocrine sensitivity," said Amy M. Fowler, MD, Ph.D., assistant professor, Section of Breast Imaging, Department of Radiology, University of Wisconsin-Madison. "However, non-invasive detection of changes in PR expression with 18F-FFNP during an estradiol challenge may be an earlier indicator of the effectiveness of a specific hormone therapy."